Fish of the week goes to Randy this round. This is one of the many great rainbows that settled into our net, and posed for some great photos, in the semi-blizzard that encompassed most of our day last Thursday on the Missouri. A bit chilly, but hardly noticeable with the forty mile an hour wind in our faces! Yikes! We had a great time though, and I was fortunate enough to have two of my really, great clients that showed no fear in venturing out into the wild weather show that hit us in Montana that day. It was supposed to be fifty degrees the day of our trip, but mother nature, obviously, had other plans! The Missouri is an awesome river, and was kind enough to have the trout "strapping on the feed bag" for us, and keeping us well entertained during yet another spring snow storm. Our snow packs are as healthy as they've been in years, for this time of the season, and we are expecting another banner year for our water and wild trout! The shape our fish are in right now was well observed during our skwalla stone fly hatch this March and April. 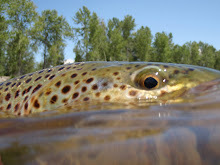 Big, fat, beautiful, healthy trout were seen rising and smiling for the camera all spring long! The mayfly activity was incredible as well, and a brief showing of caddis made the last week of our (early) spring fishing even more memorable for our dry fly enthusiasts! We also enjoyed a very gradual rise in the waters this spring, and that kept the fish feeding on top like champs for us. With no unexpected blow outs on the river, until the end of April when it's supposed to happen, it was truly a great spring here in western Montana! I'm still waiting on some of the pics that clients took with their cameras, to pop up some extra "fish of the week" photos soon. The newest video will be out soon, with some great dry fly eats, and some trout that must have lived in Hollywood for a year or two, judging from their acting skills. A whitefish may have been used as a stunt double in the next episode, but rest assured, no game fish were harmed in the making of our next video! Here's a couple more pics of the "arctic blast" we fished in on the 'MO, and here's looking at an incredible fishing year in 2009!!! Come "GET YOUR FISH ON"!! !